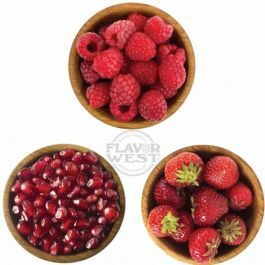 Yumberry is a profile combination of your favorite berry flavors. Enjoy the delightful taste and scent. This mouth-watering flavor is great for just about any recipe. Type: Yumberry Water soluble flavoring. Ingredients: Natural and Artificial Flavoring, Water, Ethanol and Propylene Glycol. USP Kosher Grade Flavoring. Usage Rate: 15-20% for E-use. Flavor suitability: Desserts, cakes, pastries, ice creams smoothies, drinks, beverages, baked treats and more. Specific Gravity: 1.08 No Refunds on Flavoring. Don't let the photo fool you. I was intrigued by this flavor, because a Yumberry is an actual fruit. So I wanted to see if it was like the Chinese fruit, or if it was a blend like the photo used on this listing suggests. Turns out, it is just like the Chinese Yumberry. I am very happy to have found this concentrate!! But I do wish that Flavorwest could use a proper photo. This has to be one of the best flavors I have vaped to date. It has a very strong but smooth fruit flavor blend.